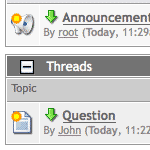 The thread list contains the threads of a selected forum. The threads may be separated into important threads or announcements and normal threads. Clicking the table head the threads can be sorted. You have already read this thread. If a thread contains unread posts it is displayed bold. In front of the thread name is an arrow icon that takes you to the first unread post within the thread. A doubleclick on the thread icon will mark the thread as read. Threads may be closed by moderators, replies are then no longer possible. The administrator can set certain forums moderated, meaning that threads are marked disabled after they are created. A moderator has to enable the thread first to make it accessible by other users. Moderators will see those disabled threads marked green. Deleted threads will be marked red and stay visible for moderators only until they are removed completely. If you click on one of the threads you will see the posts of this thread. There are displayed together with information about their authors.